This meringue pie topping is made with a French, or common meringue. It is typically a combination of egg whites whipped with sugar. We used cream of tartar in this version because it offers a little more stability. If you don't have cream of tartar, you can leave it out. If you can find superfine sugar, it is the best sugar to use in a meringue. 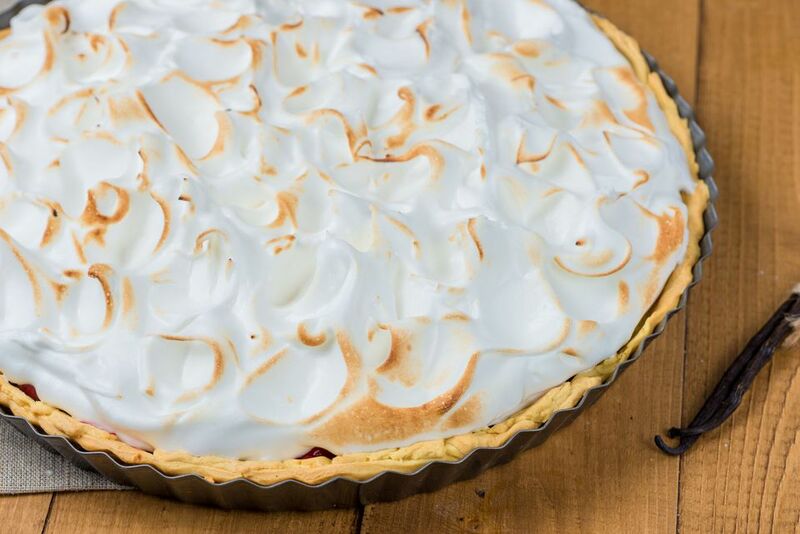 It isn't always possible, but if it is, spread the meringue on a hot pie filling. And for safety, a meringue must be cooked to the safe minimum temperature of 160 F. For a two or three egg meringue, 15 minutes in a preheated 350 F oven should be sufficient. If you have pasteurized eggs, you can cook the meringue more quickly at a higher temperature. A meringue cooked at 425 F for a short period of time generally has fewer problems. In a mixing bowl -- preferably stainless steel or glass -- beat the egg whites and a pinch of salt on low speed of an electric mixer until they are frothy. Add the cream of tartar and increase the mixer speed to medium; continue beating until the whites are fluffy, with large bubbles forming around the edges. With the mixer running, add the sugar, a few teaspoons at a time, ​or until all of the sugar is incorporated. Continue beating until the peaks are firm, but still glossy. Add the vanilla. Spoon the meringue onto the hot pie filling. If you are topping an unbaked pie filling, have it at room temperature before you top it with the meringue. Spread the meringue to the crust edge to seal the filling in. Fluff it with the back of a spoon to make decorative peaks across the pie. Bake at 350 F (180 C/Gas 4) for about 12 minutes for 2 egg whites or about 15 minutes for 3 egg whites. For safety, a meringue must be cooked to the safe minimum temperature of 160 F.
A cornstarch and water mixture is a great way to provide stability to a meringue. Make a paste with 1/4 teaspoon of cornstarch and 2 teaspoons of water. Heat it in the microwave oven for 10 or 15 seconds, or until the paste is clear. Once peaks have formed on your meringue mixture, beat in the cornstarch mixture, adding 1 teaspoon at a time. In some cases, weather, baking temperature, or technique can cause issues when making meringue. So if something goes awry, back track your steps. When making meringue, there's an issue called weeping and beading that can come from sugar or moisture. To avoid this, make sure not to refrigerate the meringue while it is still warm, or cook it for too long or at too high a temperature. Make sure to spread the meringue all the way to the crust, otherwise the meringue might shrink on the filling when you bake it.